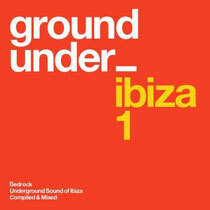 After successful Miami releases and with all three CDs of the series completely selling out, Bedrock present their first ever ‘Underground Sound Of Ibiza’ album release. The double CD features a poolside/daytime vibe on Disc 1, full of laidback Balearic beats, ideal for those summer days. The album features exclusive new music from the likes of Pig&Dan, Charlie May and King Unique, alongside some special new versions and takes on some of the label’s recent releases from The Japanese Popstars, Jimmy Van M, Oniris and the ambient version of Jemmy's ‘Waterloo Blues’, a track that caused a huge stir when it was broadcast from the Transitions 500 Miami Boat Party. Disc 2 takes a more up-tempo, clubbier/night-time journey and takes in 10 exclusive new tracks from the likes of Marco Bailey, Sasha Carassi, Misstress Barbara and Marc Marzenit, amongst others. There is also a bonus remix of the classic Guy J single 'Lamur' courtesy of Sebastien Léger. It’s out 7 July, check it out below.